DELAFIELD, Wis. (Stockpickr) -- Stocks came under selling pressure on Wednesday for the second day in a row, b despite that weak action, there were a number of small-cap stocks that experienced large moves to the upside and counter-trended versus the overall market drop. Traders savvy enough to follow the low-priced names and trade them with discipline and sound risk management are banking ridiculous coin on a regular basis. As the saying goes, "there's always a bull market somewhere," and that bull market is often times found in select small-cap stocks. Just take a look at some of the large movers in the under-$10 complex from Wednesday, including Voltari (VLTC, which exploded to the upside by 147%; Nymox Pharmaceuticals (NYMX, which ripped higher by 49.6%; RMG Networks (RMGN, which trended higher by 24.6%; and Oi S.A. (OIBR, which jumped to the upside by 20%. You don't even have to catch the entire move in lower-priced stocks such as these to make outsized returns when trading. One under-$10 stock that's starting to trend within range of triggering a big breakout trade is Hercules Offshore (HERO, which provides shallow-water drilling and marine services to the oil and natural gas exploration and production industry worldwide. This stock has been hammered by the sellers over the last six months, with shares falling huge by 78.9%. If you take a glance at the chart for Hercules Offshore, you'll see that this stock been uptrending over the last few weeks after tagging a new 52-week low of 34 cents per share. During that uptrend, shares of HERO have been making higher lows as the stock attempts to rebound out of a bearish downtrend over the last six months. Shares of HERO spiked sharply higher on Wednesday and showed relative strength as the market fell. That spike is now quickly pushing shares of HERO within range of triggering a big breakout trade above a key downtrend line. 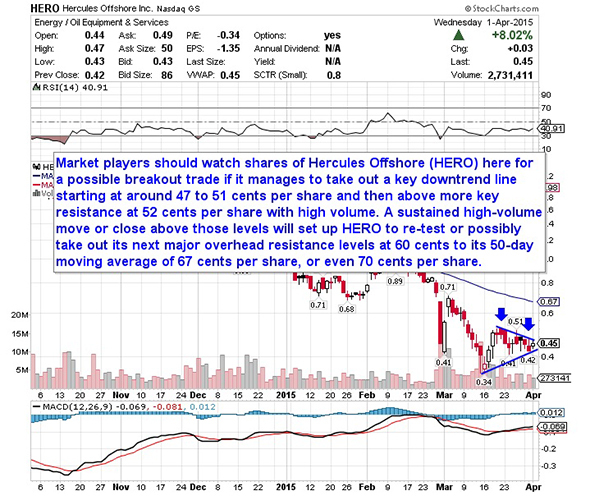 Market players should now look for long-biased trades in HERO if it manages to break out above that key downtrend line that will trigger above 47 to 51 cents per share and then above more key near-term overhead resistance at 52 cents per share with high volume. Look for a sustained move or close above those levels with volume that hits near or above its three-month average action of 3.93 million shares. If that breakout hits soon, then HERO will set up to re-test or possibly take out its next major overhead resistance levels at 60 cents to its 50-day moving average of 67 cents per share, or even 70 cents per share. Traders can look to buy HERO off weakness to anticipate that breakout and simply use a stop that sits right below some key near-term support at 41 cents per share. One can also buy HERO off strength once it starts to clear those breakout levels with volume and then simply use a stop that sits a comfortable percentage from your entry point. Another under-$10 stock that's quickly trending within range of triggering a big breakout trade is MagnaChip Semiconductor (MX - Get Report), which designs and manufactures analog and mixed-signal semiconductor products for consumer, computer and communication applications. This stock has been slammed lower by the bears over the last six months, with shares down sharply by 50.4%. 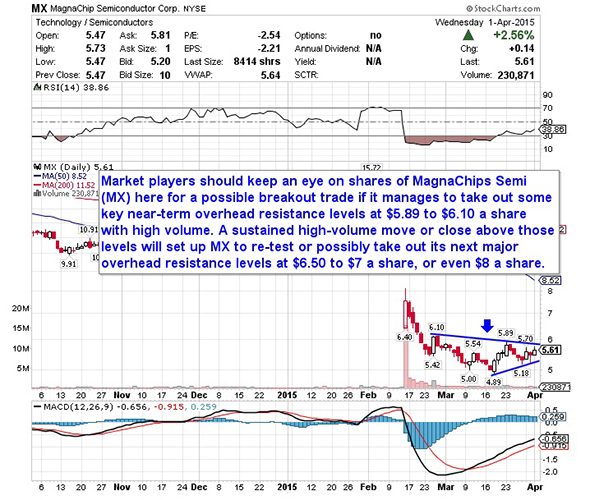 If you take a look at the chart for MagnaChip Semiconductor, you'll notice that this stock gapped down sharply in February from over $14 a share to under $7 a share with massive downside volume. Following that gap down, shares of MX continued to trend lower with the stock making a new a new 52-week low of $4.89 a share. Following that low, shares of MX have now started to rebound with the stock trending back above $5 a share. Shares of MX showed relative strength on Wednesday as the market fell, since the stock closed up 2.5%. That strength has now pushed shares of MX within range of triggering a major breakout trade above some key near-term overhead resistance levels. Market players should now look for long-biased trades in MX if it manages to break out above some key near-term overhead resistance levels at $5.89 to $6.10 a share with high volume. Look for a sustained move or close above those levels with volume that hits near or above its three-month average action 756,218 shares. If that breakout triggers soon, then MX will set up to re-test or possibly take out its next major overhead resistance levels at $6.50 to $7 a share, or even $8 a share. Traders can look to buy MX off weakness to anticipate that breakout and simply use a stop that sits just below some key near-term support levels at $5.18 or at its new 52-week low of $4.89 a share. One can also buy MX off strength once it starts to take out those breakout levels with volume and then simply use a stop that sits a comfortable percentage from your entry point. One under-$10 basic materials player that's starting to trend within range of triggering a big breakout trade is Niska Gas Storage Partners (NKA, which owns and operates natural gas storage assets in North America. This stock has been destroyed by the bears over the last six months, with shares down massive by 84.3%. If you take a glance at the chart for Niska Gas Storage Partners LLC, you'll see that this stock spiked higher on Wednesday during the market selloff right off some key near-term support at $1.78 a share. That spike is now quickly pushing shares of NKA within range of triggering a big breakout trade above a key downtrend line that dates back to Mid-February. Traders should now look for long-biased trades in NKA if it manages to break out above that key downtrend line that will trigger above $2 to $2.06 a share and then over more resistance at $2.10 a share with high volume. Look for a sustained move or close above those levels with volume that hits near or above its three-month average action of 472,974 shares. If that breakout materializes s soon, then NKA will set up to re-test or possibly take out its next major overhead resistance levels at its 50-day moving average of $2.26 a share to $2.58 a share. 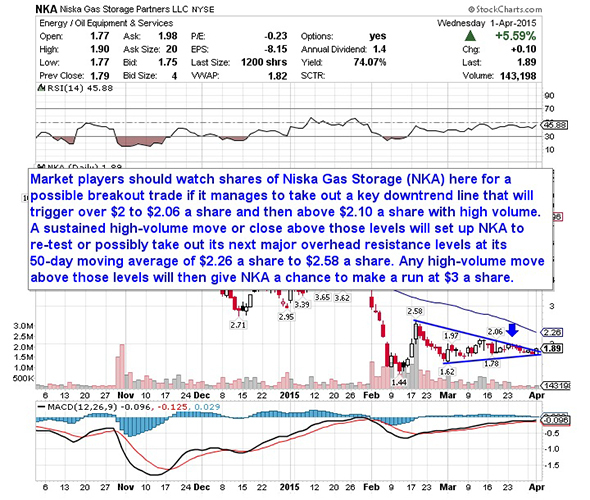 Any high-volume move above those levels will then give NKA a chance to make a run at $3 a share. Traders can look to buy NKA off weakness to anticipate that breakout and simply use a stop that sits just below Wednesday's intraday low of $1.77 or above more near-term support at $1.62 a share. One can also buy NKA off strength once it starts to take out those breakout levels with volume and then simply use a stop that sits a comfortable percentage from your entry point. An under-$10 biotechnology player that's starting to trend within range of triggering a near-term breakout trade is Aveo Pharmaceuticals (AVEO - Get Report), which develops targeted therapies for patients with cancer and related diseases. This stock has been on fire over the last three months, with shares exploding higher by 80%. If you look at the chart for AVEO Pharmaceuticals, you'll see that this stock spiked notably higher on Wednesday right off some near-term support at $1.40 a share with decent upside volume flows. Volume for the day registered over 1.2 million shares, which is just above its three-month average volume of 1.05 million shares. That spike to the upside is now starting to push shares of AVEO within range of triggering a near-term breakout trade above a key downtrend line. Market players should now look for long-biased trades in AVEO if it manages to break out above that key downtrend line that will trigger over around $1.53 to $1.55 a share and then above some major near-term overhead resistance at $1.60 a share with high volume. Look for a sustained move or close above those levels with volume that hits near or above its three-month average volume of 1.05 million shares. 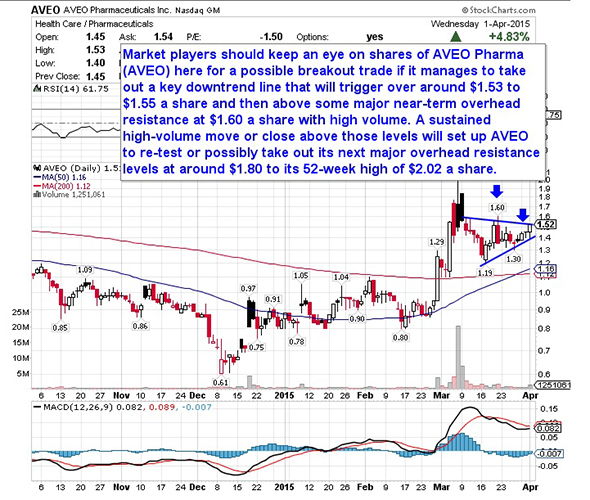 If that breakout develops soon, then AVEO will set up to re-test or possibly take out its next major overhead resistance levels at around $1.80 to its 52-week high of $2.02 a share. Traders can look to buy AVEO off weakness to anticipate that breakout and simply use a stop that sits right below some near-term support at $1.40 a share. One can also buy AVEO off strength once it starts to trend above those breakout levels with volume and then simply use a stop that sits a comfortable percentage from your entry point. 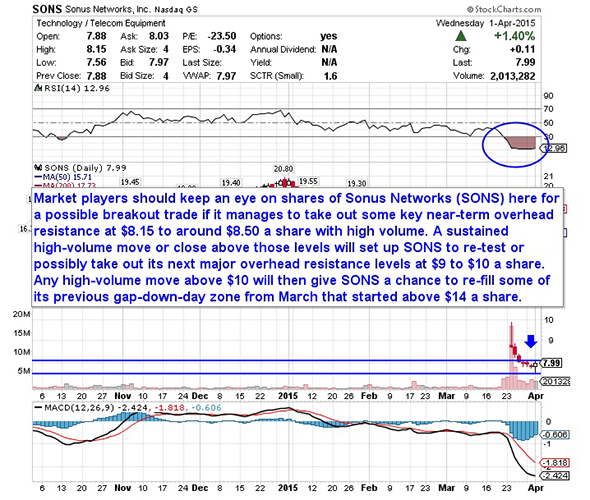 One final under-$10 stock that's starting to trend higher within range of triggering a near-term breakout trade is Sonus Networks (SONS, which provides networked solutions for communications service providers and enterprises. This stock has been hammered lower by the sellers over the last three months, with shares down big by 59.7%. If you take a glance at the chart for Sonus Networks, you'll see that this stock gapped down huge a few weeks ago from over $14 a share to under $9 a share with heavy downside volume flows. Following that move, shares of SONS continued to trend lower with the stock printing a new 52-week low on Wednesday of $7.56 a share. This entire slide to the downside in SONS over the last few weeks has now pushed the stock into extremely oversold territory, since its current relative strength index reading is 12.9. Oversold can always get more oversold, but it's also an area where a stock can experience a powerful bounce higher from. Traders should now look for long-biased trades in SONS if it manages to break out above some near-term overhead resistance levels at $8.15 to around $8.50 share with high volume. Look for a sustained move or close above those levels with volume that hits near or above its three-month average action 1.03 million shares. If that breakout kicks off soon, then SONS will set up to re-test or possibly take out its next major overhead resistance levels at $9 to $10 a share. Any high-volume move above $10 a share will then give SONS a chance to re-fill some of its previous gap-down-day zone that started above $14 a share. Traders can look to buy SONS off weakness to anticipate that breakout and simply use a stop that sits right below its new 52-week low of $7.56 a share. One can also buy SONS off strength once it starts to clear those breakout levels with volume and then simply use a stop that sits a comfortable percentage from your entry point.